Bugatti specialists Gentry Restorations Ltd, has said a fond farewell to its first retiree, long-standing employee, colleague and friend - Graham Humphris. 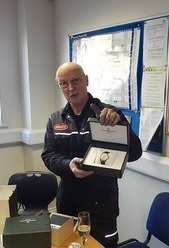 Graham who turned 68 years of age on Sunday 18th March, left the company on Friday 16th March after 16 years of exemplary service. Gentry Restorations opened its doors on the 1st January 2000. Graham joined just a couple of years later in 2002 and was instumental in helping the business become firmly established. Graham was no stranger to restoring Bugattis, prior to joining Gentry Restorations he had worked on them for 9 years in a previous employment. Born in 1950, Graham left school at 15 years of age and in September 1965 became an apprentice toolmaker at, what was then called, Oxford Pressed Steel - now BMW's Mini assembly plant. Following his apprenticeship, he remained with the company for 25 years, ultimately becoming a trainer, teaching toolmaking and machining. Not long after his 40th birthday in 1990, Graham left Pressed Steel to join a vintage Bugatti restoration business. In 1999, he left that company and became self-employed to specialise in rebuilding engines. Just 3 years later, Graham heard about a new vintage Bugatti restoration business that had recently opened. On the 8th April 2002, Graham joined Gentry Restorations Ltd.
On Thursday 15th March 2018, his colleagues gathered to present Graham with his retirement gifts. The directors presented him with a Frederique Constant Horological Smart Watch and his colleagues handed him an experience voucher - a helicopter sightseeing flight over London for two people. Commenting on Graham's time at Gentry Restorations, Stephen Gentry, managing director, had this to say; "During his 16 years with us, Graham was a very loyal and hard-working employee of the company. He has restored countless Bugattis over the years and his projects have always been stunning. Graham has built excellent relationships with many of our customers and we'll all miss him. On behalf of the entire team at Gentry Restorations and our customers, we wish Graham, a long, healthy and happy retirement."